In 2001 British Columbia began an aggressive regulatory reform program. One motivation for reform was no doubt the disappointing economic growth the Canadian province experienced in the years prior. As of 2015, however, the province is now a leader in Canadian economic performance. The possibility of achieving similar gains in the United States—where growth has been disappointing in recent years—is one reason why regulatory reform may be an attractive option for policymakers at all levels of government. The 1990s were sometimes referred to as a “dismal decade” in British Columbia; some commentators even joked that the acronym BC referred to the province being a “basket case,” rather than its name. 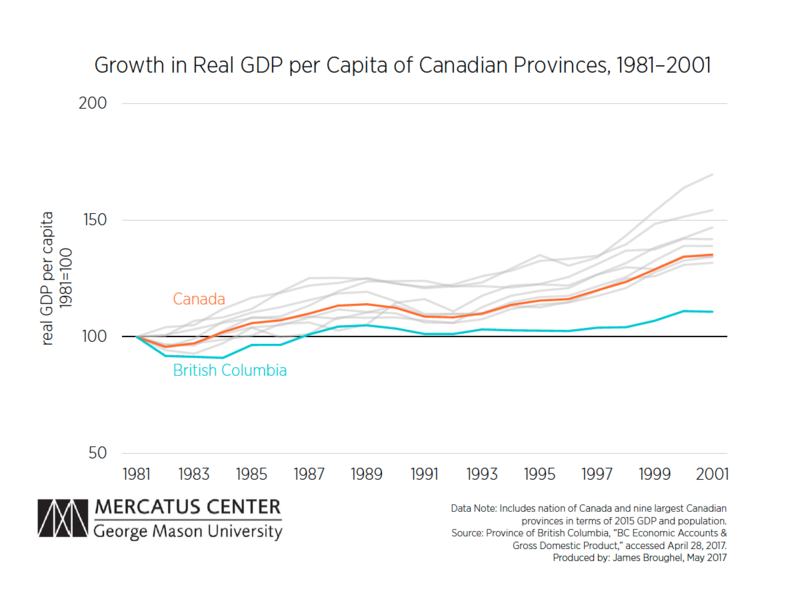 It is not surprising then that British Columbia was one of the worst performing economies in Canada around that time, as is demonstrated in the first chart. The first chart plots real GDP per capita across time for the nine largest Canadian provinces in terms of 2015 GDP and population. Also included are changes for the nation of Canada as a whole. The base year is 1981, meaning the lines in the first chart plot how income per person changed relative to each region’s 1981 level. As is clear from the graph, British Columbia performed considerably worse by this measure than any other major economy in Canada. In 2001 leaders in British Columbia sought to reduce regulatory requirements by one-third within three years. Reformers not only achieved this goal, but they have cut regulation levels further in the years since—nearly 50 percent in total. The economic situation in British Columbia changed dramatically. 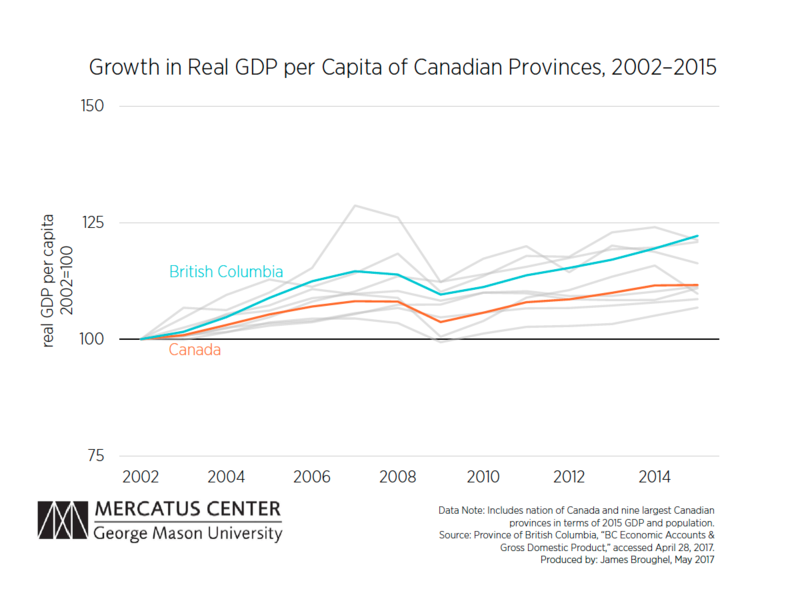 As of 2015, British Columbia is now Canada’s best performing major economy in terms of real GDP per capita growth since 2002. The second chart plots this U-turn. The turnaround represents a growth miracle of sorts. The question from a public policy perspective is whether this success can be transferred elsewhere. Many factors likely contributed to British Columbia’s boom, but was regulatory reform the key ingredient? Luckily, the core elements of British Columbia’s reform are replicable, meaning other governments can copy the British Columbia regulatory reform model. These elements include establishing a goal to reduce regulation levels by a specified amount within a set period of time, carefully measuring how much regulation is in place, and capping regulation levels to ensure reduction targets can be met and unwanted regulatory accumulation does not return in the future. Strong leadership and public support are also important, which take time and opportunity to develop. Nonetheless, by emulating its neighbors to the north, perhaps the United States can set off a growth miracle of its own. Cutting Red Tape in Canada: A Regulatory Reform Model for the United States?